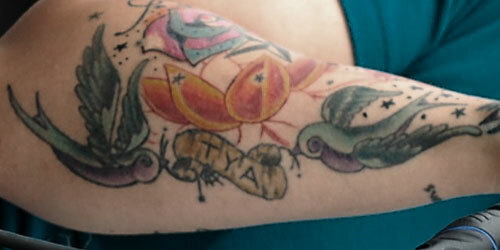 Christina Applegate has a sparrow tattoo on the left side of her lower abdomen. 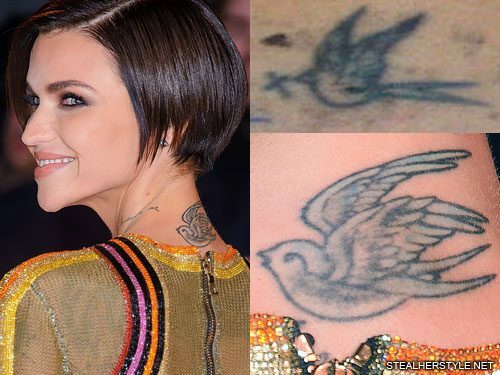 Ruby Rose has a blue swallow tattooed on the back of her neck. 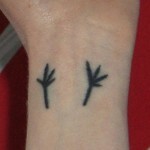 Swallows are a common traditional sailor tattoo representing freedom. 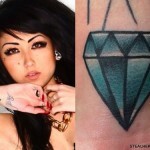 This is one of Ruby’s older tattoos and she has had it re-worked. 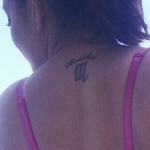 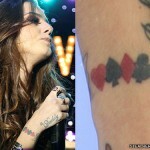 Pictured top-right is the original tattoo in 2010, which was smaller and was just an outline. 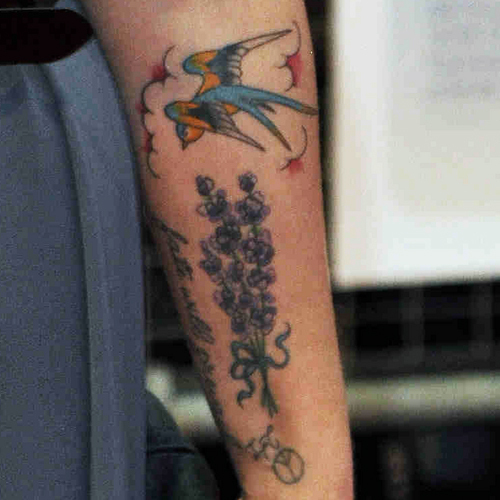 The cover-up is filled in with shades of blue and looks more cartoonish. 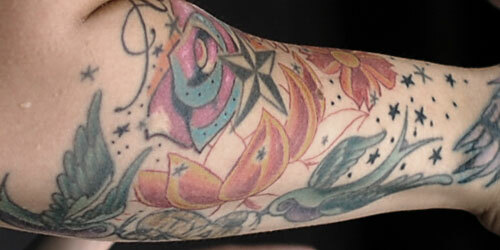 Just below Krysta Cameron’s right elbow is a black and white a nautical star tattoo surrounded by flowers. 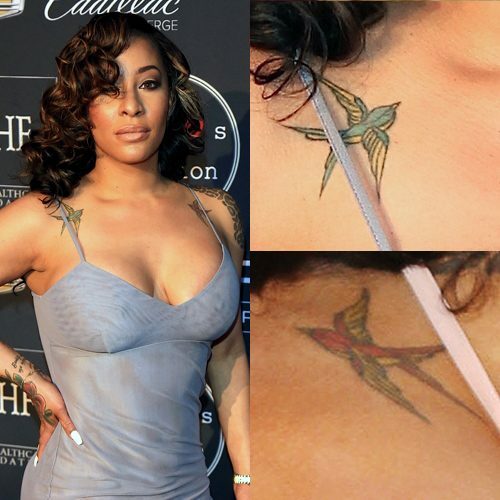 She had the star first and added the orange flowers and then the blue and pink rose. 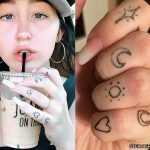 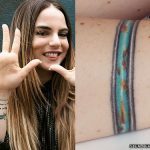 She also has tiny stars and dots to fill in the open spaces on her sleeve, and later added a gray background behind some of the stars on her wrist. 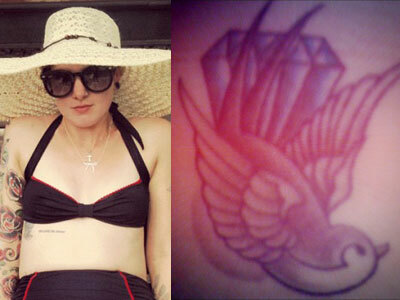 Bonnie McKee has a blue sparrow tattoo on the right side of her bikini line, seen here in her “Bombastic” music video. 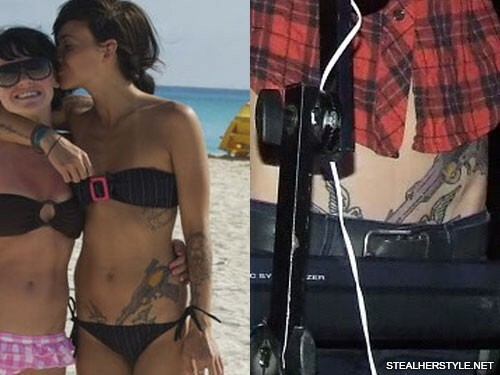 Katie Waissel’s left arm tattoo include a bird flying in front of clouds, a bundle of lavender flowers, and a peace sign.